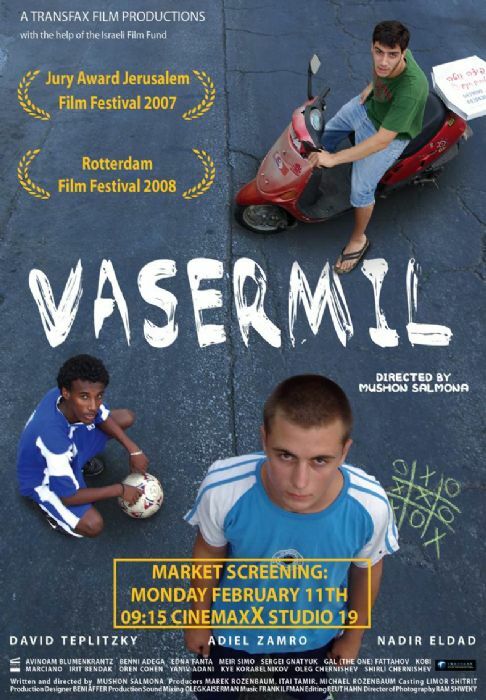 The film, named after the soccer stadium located in the Be'er Sheva in southern Israel, tells the story of three teenagers who pin their hopes on football as a way out of an unforgiving environment. They all live in a tough neighborhood. Shlomi, a pizza delivery boy, lives with his widowed mother, little sister, and step-father. Adiel, of Ethiopian descent, has to look after his young brother and sick mother. Dima is a new immigrant from Russia whose father is unemployed and whose mother works as a cleaning lady. The three teenagers are recruited by the coach of the local soccer team to take part in the Be'er Sheva Youth Championship, traditionally held, on Independence Day at theVasermil stadium. Learning to work together as a team is the key to success in the tournament and success at the tournament means getting noticed by the scouts of the local soccer empire – Hapoel Be'er Sheva. In order to win the tournament they will have to play as a team, overcome their differences, and get over their sense of inferiority and prejudice.